Kopparberg launches ‘Outside is Ours’, a 60-second commercial created by 18 feet & rising. 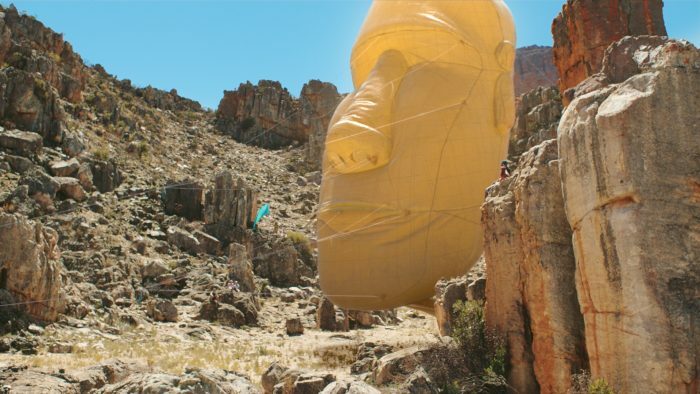 Directed by BlinkInk’s Noah Harris, the advert’s intriguing narrative leads with an awe-inspiring tribe of spirit kites which mesmerizingly come together across a sun-soaked valley. Drawing on nomadic and tribal imagery, the spot personifies the essence of summer – characterised by being outdoors with friends. The scene is set against the backdrop of rocky hills in a sandy valley. A mesmerising array of aerial sculptures and kites whirl through the sky. The sun peaks in the beautifully clear skyline as the intriguing flying creations take centre stage. The designs – which include a Mayan mask, a monkey, a dog, a man and woman, spirits and an Egyptian eye – form visual representations of diverse tribes, acting as a metaphor for friends coming together outdoors. Each flown by a different person, the unique kites spectacularly cavort and intertwine with one another in the air. One epic sculpture, designed in the style of an Easter Island head, mysteriously emerges between the canyon’s rocks guiding the others to a central moment of carefree collectiveness. Post production house nineteentwenty worked closely with Noah Harris on the job from start to finish. VFX supervisor Ludo Fealy was on set on the shoot in South Africa, where the kites were being filmed in camera. Some of the more complex and intricate kite designs were built in post. Notably the epic Easter Island Head to which all of the kite sculptures flock together. In addition to the impressive 3D modelling, nineteentwenty also reconstructed shots by bringing certain kites into the frame and removing others to create a seamless and emotive narrative. The studio also added finishing touches including sky replacement, stabilising shots and lens flares – all completed within three weeks of the shoot.